"What?! Are you crazy?! You never do that! You fool!" People got a little crazy during a routine design meeting in the Firaxis Games offices, where the developers of Civilization V take strategy very seriously. A designer talking about his recent playthrough to a large group of his gathered colleagues casually mentioned he didn't like the starting position of his settler so he moved it that turn to look for greener pastures. The reaction was immediate. Half the designers in the room erupted in anger and disbelief - while the other half vehemently defended the move. They ditched what the meeting was supposed to be about, and instead argued for or against a specific move in the first turn of a Civ game. Clearly, this issue was very important. Sid Meier once said that all good games were a series of interesting decisions, and it's a testament to the power of Civilization that even the first decision could evoke such a strong reaction in the current Civ team at Firaxis. But why? Why is moving your settler or not so important? It's a question I've struggled with in my own time with the series. I spoke to Firaxis to figure that out, and maybe discover if there's empirical evidence to support either decision beyond individual play style. The three developers I spoke to were Ed Beach, lead designer on the last two Civ V expansions, Peter Murray and Dennis Shirk, and they all had very different positions on the Settler Dilemma. 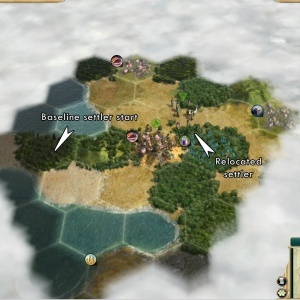 "I was on the side saying 'You never move your settler' when he first mentioned it," said Dennis Shirk, longtime producer of the Civilization series. "You never know how everything is going to ripple across the entire game." The first Civilization came out in 1991, and the series has been a PC gaming staple ever since. Originally designed by Sid Meier, Civ lets you take on the role of a famous cultural group like the Egyptians or the Chinese and guide it through an alternate history from the Stone Age to the Nuclear Age and beyond. You found cities with settlers, and those cities can produce military units or buildings. How quickly these cities grow or research science is directly dependent on the makeup of the landscape around them. And because Civilization is a turn-based game you begin with one single settler, what you do in those first few turns matters. If you don't have a city providing you with culture or science for even one turn, you may be missing out and never be able to recover. "It is so ingrained in my head," Shirk continued, "how bad it would be to lose out on that early production, culture or food. It feels bad. I can't do it. I have to click 'Found City.'" "It's also possible to scout a little bit, and maybe just tweak your settler one hex and still settle on the first turn," Beach said. "But the more extreme strategy of going off one to three turns trying to find a better settling spot, the discussion was very heated as to whether that was something you should ever pursue."